1Department of Molecular Medicine, Faculty of Medicine, University of Malaya, 50603 Kuala Lumpur, Malaysia. 2Faculty of Dentistry, Ibb University, P.O.Box 70627, Ibb, Yemen. Burn trauma and wounds are still a major problem in developing countries, often having severe complications and involving high costs for therapy. An important aspect of the use of traditional medicinal remedies and plants in the treatment of burns and wounds is potential to improve healing and the same time to reduce the financial burden. Several plants and herbs have been used experimentally to treat skin disorders, including wound injuries, in traditional medicine [1,2]. Ficus deltoidea, a native shrub from the family of Moraceae, is widely distributed in several countries of the Southeast Asia including Malaysia. In Malaysia, F. deltoidea is commonly known as Mas cotek, serapat angin, telinga beruk and other few names. Mas cotek also known as sempit-sempit and agoluran for people in Sabah, Sarawak, and kalimantan islands. Indonesian people know this type of plant as tabat barito. In africa, it is known as ‘Kangkalibang’. Mistletoe fig, Mistletoe rubber plant are names used by some other countries . Different parts of the plant are used traditionally to treat various kinds of ailments. The fruits are used to relieve headache, chewed for toothache and cold, whereas powdered root and leaves of the plant has been applied externally to wounds and sores. Additionally, root and leaves around the joints for relief of rheumatism and traditionally consumed as herbal drink for women after childbirth to help in strengthen up the uterus . Besides being one of the popular herbs used in Malay traditional medicine, its pharmacological properties have not been fully studied. Very less publications indicating scientific findings of this plant have been published. For example, two studies have shown that fruit extract of F. deltoidea demonstrate inhibitory effects against Angiotensin-I Converting Enzyme, suggesting it possess anti-hypertensive properties . Aqueous extract of F. deltoidea leaves contains pharmacologically active constituents which possess hypoglycemic effects , anti nociceptive activity , and no sub-chronic toxicity . There were no reports regarding the wound healing effect of F. deltoidea which encourages us to evaluate the wound healing activity of this plant extract in rats. An aqueous cream placebo was obtained from Department of Pharmacy, Faculty of Medicine, University of Malaya (Sunward Pharmaceutical SDN BHD. MAL 19920890X). Intrasite gel was purchased from Pharmacy of University of Malaya Medical Centre. Intrasite gel is a colorless transparent aqueous gel which contains a modified carboxymethylcellulose (CMC) polymer together with propylene glycol as a preservative. Intrasite gel is an amorphous hydrogel which gently rehydrates necrotic tissue and facilitates autolytic debridement while loosening and absorbing exudation and slough, clearing the way for effective wound healing. It can also be used to provide the optimum moist wound management environment during the wound closure especially in the later stages of wound healing. Its non-adherent and harmfulness to the viable tissue or the skin surrounding the wound makes its use is ideal for every stage in the wound management process . Intrasite gel is a trademark for Smith and Nephew Ltd., UK. Lignocaine, a local anesthesia, was purchased from the Experimental Animal House, Faculty of Medicine, University of Malaya (Delta Veterinary Laboratory PTY LTD, NSW 20011). 1 ml of Lignocaine was injected subcutaneous. Whole-plant of Ficus deltoidea was purchased from Chemical Engineering Pilot Plant (CEPP), University of Malaysia Technology (UTM), Skudai. The plant was identified by comparison with the voucher specimen deposited at the Herbarium of Rimba Ilmu, Institute of Biological Science, University of Malaya, Kuala Lumpur. The dried samples were ground into powder using Wiley mill (40-60 mesh) followed by extraction with water. 50 g of blended plant were weighted and placed into 1000 ml flask. The distilled water was added in ratio 1:20. After that, it was heated and stirred on hotplate for 3 hours followed by cooling and filtration using filter paper and filter funnel. Water was removed and using rotator evaporator. Aqueous extract was then subjected to lyophilization by a freeze-dryer to produce powdered forms of the extract. The freeze-dried products were mixed homogeneously with blank placebo in concentrations of 5% and 10% (w/w). Sprague Dawley adult male rats were obtained from the experimental animal house, Faculty of Medicine, University of Malaya. The rats were divided randomly into 5 groups of 6 rats each. Each rat with body weight between 200 - 230 g was selected and housed separately (one rat per cage). The animals were maintained on standard pellet diet and tap water. The procedures involving animals and their care conformed to the international guideline, Principles of Laboratory Animals Care. To ensure blinding, the rate of wound healing closure was randomly assessed by another searcher who did not know the treatment and control groups of animals and the final working solutions had no labels except numbers. The animals were firstly anesthetized with diethyl ether. The hair of the dorsal neck region was shaved with an electrical shaver, disinfected with 70% alcohol, and anesthetized with 1 ml of Lignocaine HCl (2%, 100 mg/5 ml). A uniform wound area of 2.00 cm in diameter was excised roundly with scissors from the nape of the dorsal neck of all rats aseptically. The day of wound creation was considered as day zero. Several studies have measured the wound area in several days and the percentage wound healing was calculated on these days [9-11]. However, our study used the method described by Morton and Molane  to calculate the rate of complete healing which is expressed as the number of the days required for reepithelialization. Incision of the muscle layer was avoided by keeping the tension of skin constant during the procedure. A standard acute toxic method was applied to determine the safe dose for the extracts. 18 males and 18 females rats were subdivided equally into 3 groups labeled as vehicle (distilled water); low (2 g/kg body weight) and high (5 g/kg body weight) dose of leaf extract preparation. Rats were deprived of food for overnight but not water prior dosing. Food was not allowed for a further 3 to 4 h after dosing. Observations on behavioral changes and mortality of the animals were done following treatment for 24 h. The acute toxicity LD50 was calculated indicating that F. deltoidea causes no lethality at all. Wounds of Group 1 rats were treated twice daily with sterile deionized water as a negative control. Group 2 wounds were dressed with a thin layer of blank placebo twice daily. Group 3 and 4 animals were treated topically with a thin layer of placebo containing 5% and 10% plant extract twice daily; respectively. A thin layer of commercial Intrasite gel was topically applied twice a day to wounds of Group 5 rats as a positive control. The wounds were observed daily until complete wound-healing enclosure occurs. Specimens of skin from healed wounds from each rat were taken and fixed in 10% buffered formalin solution for histopathological studies. Sections of the healed skin were made at a thickness of 5μl and, stained with hematoxylin and eosin (H & E), and assessed for histopathological changes. The microscopic slides were photographed. The experimental protocol for animal work was approved by the local ethics committee for animal experimentation in the Faculty of Medicine, University of Malaya, Ethics No. PM 28/-9/2007 MAA (R). All values are reported as mean + S.E.M. The statistical differences among groups were assessed using Mann- Whitney U test and one-way analysis of variance (ANOVA). A value of p<0.05 was considered significant. Statistical analysis was performed using SPSS 11.5 for Windows software (SPSS Inc, Chicago, IL). Wounds dressed with either aqueous extracts of F. deltoidea or with Intrasite gel showed considerable signs of dermal healing and significantly (p<0.05) healed earlier compared to wounds dressed with sterile deionized water or blank placebo (Table 1). There were no significant differences between wounds dressed with 5%, 10% Ficus deltoidea extract or Intrasite gel in terms of rate of wound healing enclosure (Table 1). 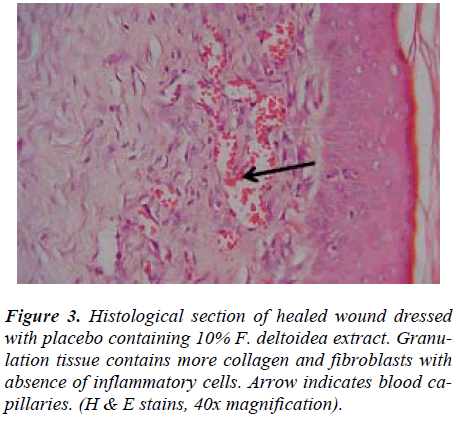 Histology of the healed wounds dressed with aqueous extracts of F. deltoidea or Intrasite gel showed significantly less scar width at the wound enclosure than healed wound dressed with sterile deionized water or blank placebo (Fig. 1 and 2). Granulation tissue of healed wounds treated with plant extracts or Intrasite gel contained comparably more proliferating blood capillaries (angiogenesis) and collagen fibers, and absence of macrophages and edema compared to healed wounds dressed with sterile deionized water or blank placebo (Fig 3 and 4). Figure 1: Histological section of healed wound dressed with placebo containing 10% F. deltoidea showing narrow scar at the wound closure (H & E stains, 4x magnification). Figure 2: Histological section of wound healing dressed with blank placebo revealed wide scar at the wound closure (H & E stains, 4x magnification). 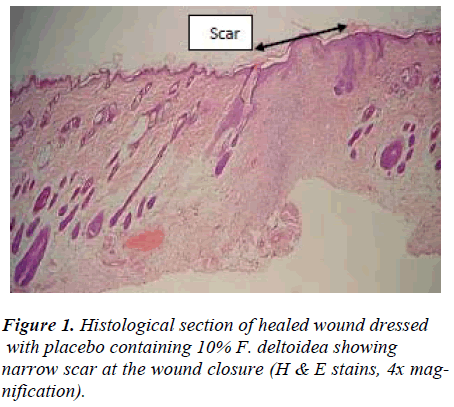 Figure 3: Histological section of healed wound dressed with placebo containing 10% F. deltoidea extract. Granulation tissue contains more collagen and fibroblasts with absence of inflammatory cells. Arrow indicates blood capillaries. (H & E stains, 40x magnification). 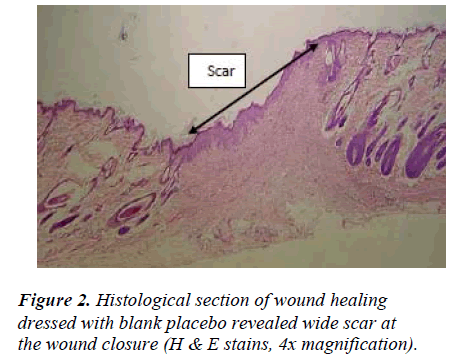 Figure 4: Histological examination of the healed wound section after treatment with blank placebo. Granulation tissue contains less collagen, fibroblasts, and blood capillaries. Arrow indicates inflammatory cells (H & E stains, 40x magnification). Wound healing is a complex and dynamic process of restoring cellular structures and tissue layers in damaged tissue as closely as possible to its normal state. Wound contracture is a process that occurs throughout the healing process, commencing in the fibroblastic stage whereby the area of the wound undergoes shrinkage. It has 3 phases, inflammatory, proliferative, and maturational and is dependent upon the type and extent of damage, the general state of the host’s health, and the ability of the tissue to repair. The inflammatory phase is characterized by hemostasis and inflammation, followed by epithelization, angiogenesis, and collagen deposition in the proliferative phase. In the maturational phase; the final phase of wound healing, the wound undergoes contraction resulting in a smaller amount of apparent scar tissue. In the present study, topical application of F. deltoidea extract significantly accelerated the rate of wound healing, and collagen, fibroblasts, and blood capillaries were contained in granulation tissue but without inflammatory cells. Wound healing effects may be due to regulation of collagen I expression  and an increase in tensile strength of the wounds . Enhanced healing activity has been attributed to increased collagen formation and angiogenesis [15,16]. Angiogenesis in granulation tissues improves blood supplementation to the wound site, thus providing nutrients and oxygen essential for the healing process . Research that is carried out by our research group (unpublished data) showed that this plant contains four active ingredients that are needed by our body such as flavonoid and tannin. It could be conceivable that the F. deltoidea extracts exert their wound healing activity through the flavonoids since flavonoids are reported to improve wound healing and protect tissues from oxidative damage . Increase in neutrophils cells infiltrating the granulation tissue delays the wound healing process  whereby neutrophils mediate lipid peroxidation through the production of superoxide anions . In conclusion, the current study revealed that wounds dressed with F. deltoidea extracts, as topical application of wounds significantly accelerate the rate of wound healing process. This study was financially supported by the University of Malaya through the Science fund grant 12-02-03-2051. Lodhi S, Pawar RS, Jain AP, Singhai AK. Wound healing potential of Tephrosia purpurea (Linn.) Pers. in rats. J Ethnopharmacol 2006; 108: 204-210. Majumdar M, Nayeem N, Kamath JV, Asad M. Evaluation of Tectona grandis leaves for wound healing activity. Pak J Pharm Sci 2007; 20: 120-124. Bailey LH, Bailey EZ. Hortus. 3rd ed. Macmillan General Reference, 1976, NY. Sulaiman MR, Hussain MK, Zakaria ZA, et al. Evaluation of the antinociceptive activity of Ficus deltoidea aqueous extract. Fitoterapia 2008; 79: 557-561. Abdullah NAH, Karsani SA, Aminudin N. Effects of F. deltoidea extract on the serum protein profile of simultaneously hypertensive rats (SHR). J Proteomics and Bioinformatics 2008; S2: 143. Aminudin N, Sin CY, Chee ES, et al. Blood glucose lowering effect of Ficus deltoidea aqueous extract. Malaysian Journal of Science 2007; 26: 73-78. Fazliana MS, Muhajir H, Hazilawati H, et al. Effects of Ficus deltoidea aqueous extract on hematological and biochemical parameters in rats. Med J Malaysia 2008; 63 Suppl A: 103-104. Williams C. Intrasite Gel: a hydrogel dressing. Br J Nurs 1994; 3: 843-846. Chah KF, Eze CA, Emuelosi CE, Esimone CO. Antibacterial and wound healing properties of methanolic extracts of some Nigerian medicinal plants. J Ethnopharmacol 2006; 104: 164-167. Nayak S, Nalabothu P, Sandiford S, et al. Evaluation of wound healing activity of Allamanda cathartica. L. and Laurus nobilis. L. extracts on rats. BMC Complement Altern Med 2006; 6: 12-17. Kwon AH, Qiu Z, Hashimoto M, et al. Effects of medicinal mushroom (Sparassis crispa) on wound healing in streptozotocin-induced diabetic rats. Am J Surg 2009; 197: 503-509. Morton JJ, Molane MH. Evaluation of vulnerary activity by an open wound procedure in rats. Archives Internationales de Pharmacodynemiie et de Therapie. 1972; 196: 117-126. Bonte F, Dumas M, Chaudagne C, Meybeck A. Influence of asiatic acid, madecassic acid, and asiaticoside on human collagen I synthesis. Planta Med 1994; 60: 133-135. Suguna L, Sivakumar P, Chandrakasan G. Effects of Centella asiatica extract on dermal wound healing in rats. Indian J Exp Biol 1996; 34: 1208-1211. Trabucchi E, Preis Baruffaldi F, Baratti C, Montorsi W. Topical treatment of experimental skin lesions in rats: macroscopic, microscopic and scanning electronmicroscopic evaluation of the healing process. Int J Tissue React 1986; 8: 533-544. Shukla A, Rasik AM, Dhawan BN. Asiaticosideinduced elevation of antioxidant levels in healing wounds. Phytother Res 1999; 13: 50-54. Szabo S, Kusstatscher S, Sakoulas G, et al. Growth factors: new 'endogenous drugs' for ulcer healing. Scand J Gastroenterol Suppl 1995; 210: 15-18. Saurez J, Herreta MD, Marhuenda E. Hesperidine and neohesperidine dihydrochalcone on different experimental models of induced gastric ulcer. Phytotherapy Research 1996; 10: 616-618. Shimizu N, Watanabe T, Arakawa T, et al. Pentoxifylline accelerates gastric ulcer healing in rats: roles of tumor necrosis factor alpha and neutrophils during the early phase of ulcer healing. Digestion 2000; 61: 157- 164. Zimmerman JJ, Ciesielski W, Lewandoski J. Neutrophil- mediated phospholipid peroxidation assessed by gas chromatography-mass spectroscopy. Am J Physiol 1997; 273: C653-661.